Where should we go tonight? Fart City or Space Prison? The clouds part to reveal a full view of the city as it bobs in and out of the cloud surface. The cloud cars and the Falcon head for the gleaming white metropolis. We're on Bespin and it starts with the Twin-Pod cloud car firing on the Falcon and ordering it not to deviate from its present path; ends with Han Solo and the crew emerging onto the landing platform. There is a good cabin rock in this scene. The reason the Falcon is being fired on, questioned and hassled is that Lando is trying to warn the crew off and save them, out of sight of the Imperial forces. The Twin-Pod cloud car (i.e. the Coast Guard) has been told to scare away Lando's old spaceship. Or this is all part of the Falcon crew getting punk'd by Lando. Once they get into visual range then the Twin-Pod cloud car pilots need to act professionally for the Empire. The Twin-Pod cloud car pilots are trying to warn them off via a coded message. They couldn't say it directly because the Empire is monitoring their communications. Han was a simpleton, too worried about the status of the spaceship (i.e. the fuel light was on) and/or completely distracted by Leia and C-3PO to pick-up on this warning. Pete has a complicated relationship with the Lando character; is he a good guy or bad guy? Joe asks "what's wrong with Lando? Does he do something bad later on?" No spoilers. C-3PO gets reactivated. Joe asks "Is Kenny Baker in there?" (Note: This episode cemented this as a SWM running joke). C-3PO's start-up sequence. He always says the last thing that he was going to say before being shut-down. "Sorry Pete" - in the prequels we see C-3PO activated maybe for the first time. Joe plays the Angry Birds Star Wars game. In the game, each bird corresponds to a character in the movie and does unique things when you tap the screen. Han Solo shoots a laser bolt. Luke uses a lightsaber and cuts everything. C-3PO's Angry Bird "special power" is to break apart and say "oh my". What did Han do to Lando that Chewbacca mentions in the cockpit? Something to do with ladies. Whatever it is Chewbacca summarizes it in one growl and Leia gives Han a look. Chewbacca is saying something like "Remember the New Jersey thing?". Probably when Han won the Millennium Falcon from Lando. Or a money or gambling thing. Han and Lando's relationship is just a constant series of betrayals. The Falcon lands on platform 327 so drink if you're playing the drinking game. The drinking game involves having a drink every two weeks or so. 327 is in Star Wars; is it in ROTJ? Chris Radtke could tell us. The prequels didn't respect / use this number which Alex thinks is just sloppy. The Falcon approaching through the clouds is beautiful - as is the music. It's like they're entering heaven where nothing bad could ever happen to them. "Sorry Pete" - this scene is improved in the special edition with longer shots of the Falcon, Bespin and Cloud City. The sequence was too short in the original movie for Joe's liking. These special edition changes work as they are not slap-sticky or overdone. Pete's response to this is "it wasn't in the original movie". The head-on cockpit shots are also great due to the extra lighting. Maybe they filmed it outside. 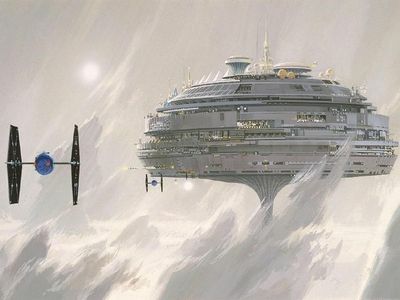 Cloud City was originally conceived as a prison ship as seen in Ralph McQuarrie's concept art. If Cloud City was a prison ship then this would make vacationing there an even harder sell to your girlfriend - "We're going to the planet with a gas mine, Fart City and a space prison". It took place on a planet called Hoth - which means cloud (or fart) in the native language. Hoth is a planet covered in thick clouds. The crew first flies to the surface of the planet, lands, gets out and goes to the city. The natives are hostile. The natives are tall creatures with white skin and hair that ride flying manta rays. They are called the "Whitebird Clan of the Cloud People" (which sounds like a Yes concept album, the Roger Dean artwork). The crew talk to the natives, get scared off and then fly off to Cloud City as we know it. They meet Lando Kadar on Cloud City. This sequence would have been very difficult to produce / film. Although it may have changed the nature of sci-fi given that it is so out there as a concept - much like Star Wars did in 1977. We see the Falcon's landing gear in motion for the first time when the spaceship lands on the platform. Joe shares his memories of seeing ESB. Saw the movie when it first came out - he was 13 years old. He read the novelization and the Marvel adaptation ahead of time. He therefore knew pretty much everything that was going to happen in the movie. This didn't diminish the experience for him. He saw it with a friend and stayed in the theater to watch it again. They saw it in Westchester County but were too young to go alone. Joe's parents therefore took them but Joe made them sit in a different row. They probably went to a theater on Central Avenue in Yonkers. Even though they were sitting 5 seats away Joe's mother still offered them throughout the whole movie. She brought a whole supermarket worth of stuff because in her mind watching a move and not eating was ridiculous. Alex vouches for this view. They lived on the Upper East Side near the Loews Orpheum theater on 86th street. He therefore saw it again four times that summer - that and Popeye which were the two big movies of that summer. Joe wanted to live in both movies - but especially on Cloud City. He still would like to live there. Joe's love of Cloud City (and Popeye) is part of the reason why he moved to Seattle in his 20s. It's got the Space Needle. It's a bit like Sweet Haven in Popeye (1980). The potential podcast "Popeye minute" is discussed. What actors are in both Popeye and ESB? Probably not too many. There is a crossover between Popeye and Dune. Paul L. Smith played Bluto in Popeye and "The Beast" Rabban in Dune. One crossover between The Shining and ESB is the fake snow that is used in both movies. The "Cloud People" are brought up again during Attack of the Clones Minute. "327" is NOT mentioned anywhere in ROTJ. The closest they get is the name of Vader's shuttle as it approaches Death Star II (ST 321). Ironically enough it IS used in The Phantom Menace. Pete: Falcon Crew! Alex: Assemble! Alex: Cabin rock! All the hits you remember. Alex: Your career has been building up to this minute. Pete: Well, that's what I say every day. Alex: Lets just say that he's not a system, he's a man. Pete:Every morning when Joe opens his closet he says "Is Kenny Baker in there?". Joe: Is that scene before or after the scene where Anakin builds the Millennium Falcon? Joe: Sometimes it is handy to break apart and say <as C-3PO> "oh my!". Joe: <In the outro> Empire Strikes Back Minute! This page was last modified on 9 January 2019, at 22:04.